Normal pits and grooves on the chewing surfaces of back teeth can trap food that can’t be removed by brushing or washed out by water or saliva. 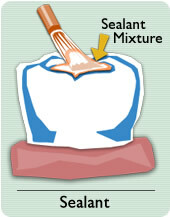 A sealant is a tough, plastic material designed to bond (stick) to tooth enamel. These clear or tooth colored sealants are painted onto the tooth surface to “seal” the pits and grooves and protect against decay. They are generally applied to children’s first permanent back teeth. They can also be useful for adults in certain situations.